A holiday tradition for our family is to have on hand, at least one or two classic pork pies or Tourtierre pie. Sometimes we cook it when we do our family turkey and other times we cook it and eat it on it’s own with a side of pickled beets or some other condiment that offsets the richness of this pie. Of course, you need a tourtierre to be made with a lard pie crust recipe – which is Paleo at least in the lard but not the flour! Here is our farmer’s market tourtierre we are having for Christmas supper tonight, with some pickled beets our daughter Ashley gave us for Christmas. What really says “Christmas” to me are all the savory smells associated with the special day, and this Tourtierre baking in the oven, is just one of those memorable smells. Tourtierre is wonderful eaten warm from the oven but I find that it is even better tasting the next day (if there are any leftovers) if you eat it cold! 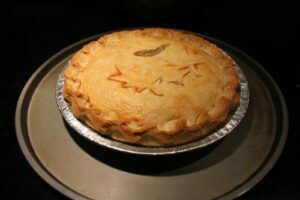 My Mother’s tourtierre recipe was made with a mixture of beef, pork and veal, with onion, potato and lots of garlic and a hint of clove and her pie crust pastry was made with lard. Merry Christmas to all family, friends, clients and anyone reading this!